The Sisters' Fate is the conclusion to the Cahill Witch Chronicles (read about book one and book two). When we last left Cate, she was pretty devastated. Maura erased Finn's memory so he has no recollection of Cate, and the death of her godmother still weighs heavily on her conscience. To make matters worse, Cate is exposed as a witch and forced to go into hiding, making it even harder for her to protect Tess and keep Maura from executing a morally questionable plan to take over the Brotherhood. As the tension escalates, Cate begins to wonder if there is any hope of preventing the prophecy from running its course. What I love about this book is that Spotswood explores the nuances of sexism and power through the sisters' different approaches at combatting the Brotherhood, and nothing is black and white in this world. Spotswood reveals the dangers of obtaining power at all costs through Maura's misguided attempts and Cate's struggle to balance the urgency of needing to save innocent people with her own ethics. This makes for some terrific tension and high stakes, and keeps the story moving quickly to a tumultuous ending. Spotswood is magnificent at plot twists and turns that are surprising and inevitable, not contrived. Cate's character development shines through her reactions to these twists, and as secrets come to light and character motivations are revealed, the story takes interesting, heartbreaking turns. Spotswood is not afraid to hurt her characters, and while many readers will likely be screaming "NOOO!" at some plot points, they are what make this third installment an emotionally resonant story. The ending is equal parts tragic and hopeful, and wholly deserved. 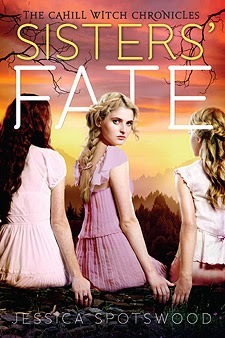 The Sisters' Fate rounds out an unique, exciting, emotionally turbulent, and romantic trilogy that is worth reading and re-reading. I admire Jessica Spotswood for exploring the ethics of power and also for allowing her characters to face the consequences of their actions, even if tragedy is the result. The Isle of the Lost Giveaway!